He’s enough of a cosmologist to know that everything contains its opposite and everything is always in flux. What else would you expect from a person starts his album with the lines, “Jesus was a pagan / Woody was a punk / Gandhi was a soldier / Hendrix was a monk”. How many songs about blue skies can you think of? There’s that classic one by Irving Berlin that’s been recorded by everyone from Al Jolson to Willie Nelson, that other classic one by the Allman Brothers that Joan Baez covered so beautifully, not to mention variations on the blue sky theme by everyone from Wilco (“Sky Blue Sky”) to Electric Light Orchestra (“Mr. Blue Sky”) to Pink Floyd (“Goodbye Blue Sky”) to Midnight Oil (“Blue Sky Mining”), ad infinitum. 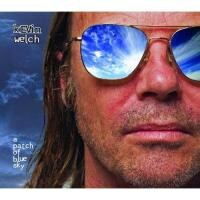 So when Kevin Welch decided to write another blue sky song, the title track from his latest release A Patch of Blue Sky, he must have known he was treading on familiar territory. Indeed, Welch acknowledges on his webiste that this is his second attempt of this song. He had recorded a different version on an earlier album. But that knowledge didn’t stop Welch. He uses the experience to write a better song (with the help of Claudia Scott). And the fact that the expression “blue sky” is a hoary cliché and songs about it as common as dirt? That’s only a plus for Welch, because he knows the truth of the truism that if you wait long enough, the sky will turn blue. Storm clouds will pass and things with will work out. Again, he says as much on his website. Of course that doesn’t stop him from beginning his album with a tune called “Come a Rain”. Good times too will pass. He’s enough of a cosmologist to know that everything contains its opposite and everything is always in flux. What else would you expect from a person starts his album with the lines, “Jesus was a pagan / Woody was a punk / Gandhi was a soldier / Hendrix was a monk”. Life is full of contradictions. There’s consolation to be found in the fact that everything changes except the fact that everything changes. Welch’s music sounds comforting as well. He plays the acoustic and electric guitar at a moderate pace and lets the melodies organically emerge. He’s joined by a sympathetic group of accompanists, which includes Bukka Allen on piano, Wurlitzer, B3, and harmonium, Brian Standefer on cello, Welch’s son Dustin on banjo and electric resonator guitar, Rick Richards on drums, Glenn Fukunaga on bass, and Fats Kaplin on pedal steel. No one takes flashy solos and everyone stays mellow. In addition, Welch sings in a conversational voice and is ably joined by a myriad of mostly female vocalists that includes Eliza Gilkyson, the Trishas, and the Burns Sisters to create familiar, soothing harmonies. The music and vocals complement each other just like the way a landscape is comprised of dirt below and the heavens above. Songs about rain and blue skies, the natural order of transformations, are Welch’s metier. Welch offers tracks about floods and brush fires, the wind and the sea, love and death, midnight and noon, dreams and waking up, etc., with the authority of one who has seen it all. The best ones, like “New Widow’s Dream”, “Andaman Sea”, and “That’s How It Feels”, do not try to resolve the contradictions. So when he tells you good times are coming, you believe him, even though you know they won’t last.